“Suzanne offers us ways we can discover and nourish resources within ourselves that enable us to feel in control, even when life is out of control,” said Richard Miller, PhD, founder of the Integrative Restoration Institute and author of The iRest Program for Healing PTSD. May is Mental Health Awareness Month and as an advocate for mental health awareness and suicide prevention, author Suzanne Ludlum has a message to send: Hope. Ludlum's recently released book, An Imperfect Pilgrim – Trauma and Healing on This Side of the Rainbow, is a compelling memoir which chronicles her harrowing experiences with trauma and severe depression to navigating her struggles and finding a pathway to healing and overcoming her demons. Ludlum allows readers into the most intimate and tragic moments of her life while she finds hope in the pathways that were the key to helping her reclaim her lost life. After suffering multiple losses and subsequent abuse at the hands of those very people who were supposed to help her, Ludlum suffered intense mental decline and fell into a darkness that seemed unrecoverable. After years of psychiatric hospitals and various therapists, she began her long climb out. She is now active in spreading her message of hope and healing to those who may still be suffering, teaching them that they are not alone and that help truly is available. As a yoga therapist and owner of Trinity Yoga Therapy, Ludlum is also involved in her local chapter of Mental Health America. Her inspiring messages and therapeutic practices are helping those who suffer from trauma and mental health issues such as PTSD. “Suzanne offers us ways we can discover and nourish resources within ourselves that enable us to feel in control, even when life is out of control. Here, she shows us that we don’t have to be defined by our circumstances. We truly can be the master of our own destiny,” said Richard Miller, PhD, founder of the Integrative Restoration Institute and author of The iRest Program for Healing PTSD. Ludlum is available for interviews and speaking engagements. Her goal is to eliminate the stigma of mental illness while inspiring a message of hope to those who feel they have no way out. Upon request, a copy of her book is available for review. To learn more please visit http://www.animperfectpilgrim.com and http://www.trinityyogatherapy.com. 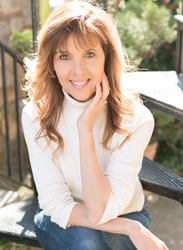 Author Suzanne Ludlum is a Certified Yoga Therapist and holds the highest credentials in her field, including a Master of Science degree in Yoga Therapy from Maryland University of Integrative Health, certification through the International Association of Yoga Therapists, and ERYT-500 designation (experienced yoga teacher at the highest level) from Yoga Alliance. She also presents at international conferences to audiences of mental health professionals and other yoga therapists. Ludlum resides in Fredericksburg, Virginia with her husband and daughter.